Agent O (can also be called Secret Agent O) is an implied secret agent in The Super Mario Bros. Super Show! episode, On Her Majesty's Sewer Service. After Princess Peach recruits Mario and Luigi, they meet Secret Agent N and he introduces himself. Luigi says "I see" followed by N saying, "Not C. N." Mario responds with "Oh," leading N to say, "Not O. N. Agent O's on holiday." Agent O is never mentioned again after this. 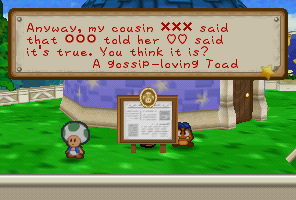 "A gossip-loving Toad" is a character who posts scribbles on the back side of the notice board in Toad Town during the events of Paper Mario. This character's posts are mainly gossips about Princess Peach. 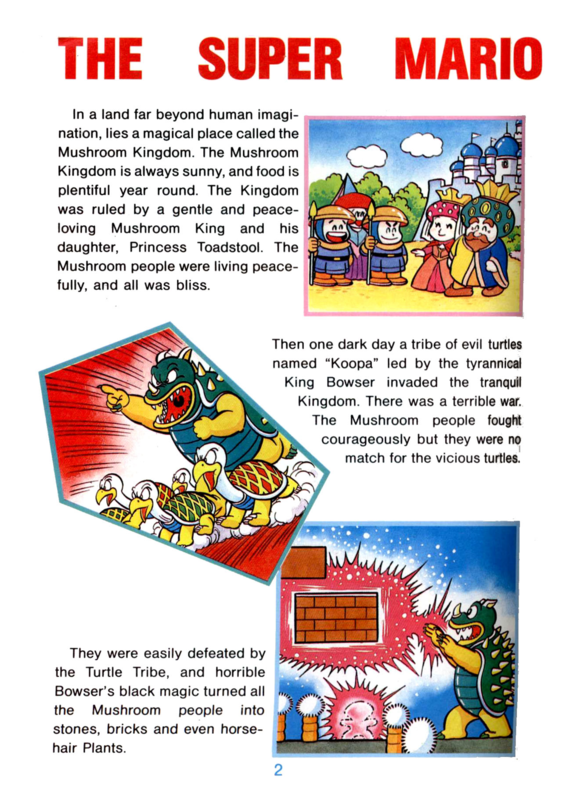 They also report that Mario has been defeated by Bowser and that Tayce T.'s cooking class will be canceled for a while. There are also scribblers who sign themselves as "A little Toad," "A scribble-loving little Toad," etc., but the name "A gossip-loving Toad" appears most frequently (5 times in total). Aunt Maria is an aunt of Mario and Luigi's who is briefly mentioned by Luigi in the The Adventures of Super Mario Bros. 3 episode "Crimes R Us." 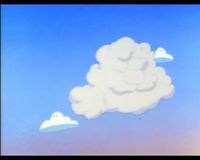 While Mario and Luigi look at clouds, Luigi comments that one of them resembles their Aunt Maria. An Aunt Maria is also mentioned in the book Doors to Doom, where Donkey Kong Jr.'s yell is compared to a cross between Tarzan's ululation and the screech Aunt Maria makes when the Mario Bros. walk on her newly waxed floor. Bachelor's girlfriend is the unseen love interest of Bachelor in the Game Boy Advance version of Donkey Kong Country 3: Dixie Kong's Double Trouble!. Bachelor implies that she is "hot," and he is currently dating her. Like Bachelor, she is presumably a bear herself.